No prior experience required. 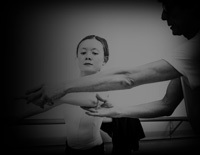 This two-day intensive worksho will cover the basics to get you ready to join a beginner ballet class. Individuals of all ages and levels of fitness are encouraged. Classes are small — held in a non-intimidating setting. Whether you're looking to improve your posture & alleviate back stress, looking to trim, tone & increase strength and flexibility, or just want to try something new — we invite you to see what ballet can do for you! To reserve your spot in the session, you must pay at a deposit of $20 via PayPal to the right, prior to the first class. The remainder will be due on the first day of the session with cash or check only. Or you may choose to pay the entire class fee with PayPal. Secure your spot in class today! You may pay either the deposit fee, or the whole class fee via paypal below. If you prepay only the deposit fee to secure your spot, the remaining fee will be due on the first day of the class, payable by cash or check only.